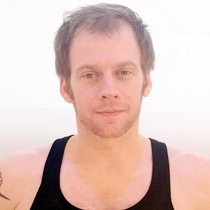 Certified Core Strength Vinyasa Yoga instructor Brian Williams is responsible for bringing “Rock and Roll” Yoga to New York City. And his clients couldn’t be more thrilled. In his private practice, which Brian claims to love, he visits clients’ homes in Manhattan and Brooklyn and works to design a practice that is suited to their individual needs and goals. These can include developing flexibility, strengthening and toning, losing weight, or simply learning to relax and let go. As a yogi, Brian honors ahimsa, the Sanskrit principle of non-harming. “It means kindness, friendliness and thoughtful consideration of other people and things,” Brian says. He passes this mantra on to his clients, along with other wisdom. “I believe in the adage that we should act as if what we are doing is the most important thing in the world, while realizing that it doesn’t matter at all,” he says.